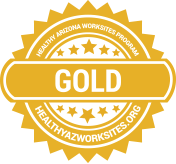 The Healthy Arizona Worksite Award: Hard Work Pays Off! The Healthy Arizona Worksite Award seeks to recognize employers that are making evidence-based efforts to support the health and well-being of their employees and their families. Organizations that meet the Healthy Arizona Worksite Award criteria will be recognized in statewide communications, at a recognition event, and on the Healthy Arizona Worksite Program website. How can you start the process of applying for the Healthy Arizona Worksite Award? The first step in applying for the Healthy Arizona Worksite Award is to attend a Healthy Arizona Worksites Program (HAWP) 101 training. The HAWP training has been developed to help organizations learn how to implement evidence-based worksite health initiatives that can improve business and employee health. Click here for upcoming training sessions. The Copper award level recognizes a business that has taken the initial steps to receive worksite health training, gain leadership support, begin organizational assessment, create infrastructure supports and fashion an introductory worksite health improvement plan. The Silver award level indicates that an employer’s worksite program has the minimum components needed for a comprehensive worksite health program including, senior level management support, an active wellness team, a program budget, and use of data. 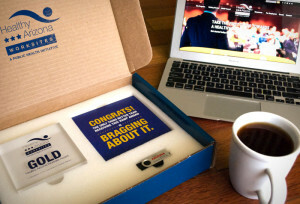 A Gold Level Award is awarded to businesses that are tracking and documenting outcomes and behavior change. Gold level programs have demonstrated institutional support and have integrated worksite health programs with business policies and benefits. Their programming is data and outcomes driven. A Platinum Level Award is awarded to businesses making an impact both within and beyond their walls addressing one or more of the many health challenges impacting communities across the state. Platinum level awardees have demonstrated data driven programming and are leveraging cross-sector collaborations or partnerships improving the health, well-being, and equity of their community. 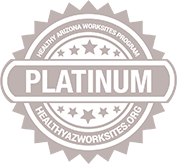 Employers that receive the Healthy Arizona Worksite Award will be recognized for their wellness efforts in statewide communications, at recognition events, and on the HAWP website.